Going to college in the United States is expensive and getting worse. Mother Jones reports that tuition has increased 1,122 percent since 1978. Comparatively, medical care has increased 600 percent and housing has gone up by less than 300 percent. Elsewhere in the world, it is not this way. Business Insider states that as of 2012, the average cost of college tuition and other expenses is 51 percent of the median income in the United States. Meanwhile, in Canada, it is 22 percent and in Sweden, it is lower than 3 percent. Many nations including Germany, Brazil, Norway, Finland and Argentina, offer college without tuition. The only costs for students are books, housing and perhaps a registration fee. Some of them offer this not only to their own citizens, but to foreigners as well. 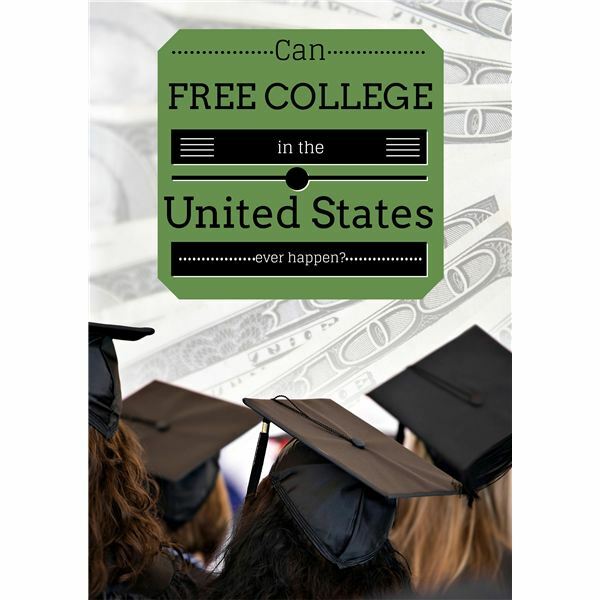 Of course, college cannot be free for everyone. It’s the taxpayers, not the students, who pay the tuition. The students graduate to become taxpayers in a nation with a heavy tax burden. Nations delivering tuition-free college (Germany 49.3 percent, Finland 43.9 percent and Sweden 42.5 percent) often have much higher income tax than the United States (31.5 percent). The entire nation, rather than only those being educated, pay the bill for advanced degrees. Student motivation becomes another problem. Something given for free does not have the same perceived value as something hard-earned. Germany has trouble with “Dauerstudenten" or “eternal students" who are unmotivated to graduate into the workforce. They do not see education as a path to a career, but as a career itself. When college is expensive, students value it. They are motivated to graduate expediently and transition into good-paying careers. Could the United States exchange tuition for higher taxes? Would it create a community of career learners unwilling to get working and pay the system back? College costs need to come back to Earth, but burdening the taxpayers is not the answer. In 2013, Oregon proposed a system that would postpone paying for college and eliminate student loans. The “Pay It Forward” plan would provide higher education for free, but graduates would pay 3 percent of their income for the next 24 years. The average graduate with a four-year degree would pay almost $40,000 over their lives or $7000 more than the cost of the degree. Those with higher incomes would pay more, of course, and lower incomes would pay less. Students would purchase their degree at a price relative to its value to them. Yet student debt is not all about tuition. Room, board and supplies are expensive. Full-time students would be either working or borrowing to cover those costs. They would not graduate debt-free. The system is far from reality. The state would have to pay $9 billion over 25 years before graduates would pay back enough to fund Oregon’s state universities. The tuition-free environment may discourage quick graduations. If students choose to take another year or more to finish school, the state pays even more. It’s a decent thought, but the idea has many holes. UoPeople is a non-profit online university headquartered in Pasadena, California. It aims to provide low-cost education worldwide. Currently it offers bachelor and associate degrees in business administration and computer science. It is accredited through the Distance Education Accrediting Commission. Students pay a registration fee of $10-50, depending on income and home nation, plus $100 for each exam. Associate degrees require 20 exams and bachelor degrees require 40. Therefore, a degree would cost $2000 or $4000 total. Students who cannot afford that can apply for scholarships. How does it work? A council of presidents representing UC Berkeley, the Indian Institute of Technology, Oxford and other international institutions leads the university. Three thousand volunteers work with a small paid staff. UoPeople has partners including the United Nations, Yale Law School, Microsoft and the Clinton Global Initiative. They contribute to a virtual Library and Resource Center powered by open source software. Multimedia lectures are delivered online. Students learn from volunteers, participate in forums and help each other find answers. Two thousand students from 150 countries are currently enrolled. Anywhere college tuition is free, taxpayers are funding it. The American system is not flawed. If you want the education, pay for it. Choose a school and degree that will increase your income and enjoy the profit. Costs for college are climbing out of control, but raising taxes is not the answer. Schools need to open their eyes to more modern and efficient ways of doing things. If education is to be affordable in the future, it will need to reinvent itself.